The Ultimate Zombie Apocalypse Survival Kit | We Zombie! You know the zombie apocalypse is coming. You know you’ll need a bug-out bag. You figure you have a couple of years to prepare, so what’s the rush? Let’s face it, you’re probably never going to have time to prepare that emergency kit, so why not just buy one? The folks at The Ready Store have created the ultimate zombie apocalypse survival kit that you can purchase and save yourself the trouble of packing your own kit. I would suggest buying several of these – one for your house, one for your workplace, and one for your vehicle. In fact, I would purchase a few extra – when you jump into that armored jeep you know you’ll be picking up a few survivors along the way and I really doubt you’ll want to share your rations with them. 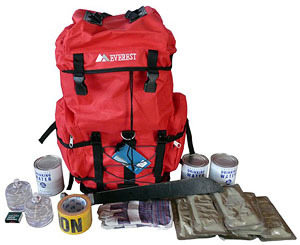 The Ready Store came up with this kit immediately after the CDC created their zombie apocalypse survival page – they’re always willing to help us be prepared for any emergency. There’s even a video describing what you’ll find in the kit as well as an interview with a zombie researcher and a zombie hunter. There are some great quotes from the zombie hunter, for example, “Zombies are tricky fellas; I’ll tell you what”. This gives me the security of knowing that we have enough for a period of time if we break down. kit has enough supplies to last for three days.